The MA300 adopts an advanced ZK fingerprint algorithm for reliability, precision and excellent matching speed. It’s metallic casing and IP65 rating enables it to be resistant from water, dust and other external damage. It also offers the flexibility to be installed standalone or with any third-party panels that support 26-bit Wiegand. 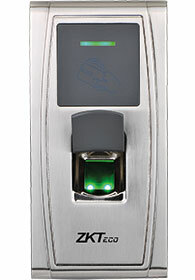 The user can be enrolled by the administrator card when the device works in standalone mode. TCP/IP and RS-485 are available, so that the device can be connected easily. It also supports Bluetooth communication and mobile phone app management.